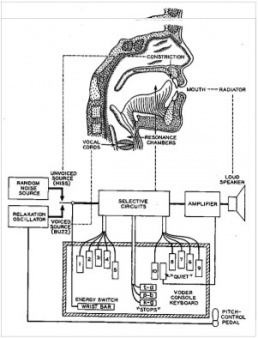 Diagram of a general communication system from Claude E. Shannon, A Mathematical Theory of Communication, 1948. Information theory is a branch of applied mathematics, electrical engineering, and computer science which originated primarily in the work of Claude Shannon and his colleagues in the 1940s. It deals with concepts such as information, entropy, information transmission, data compression, coding, and related topics. 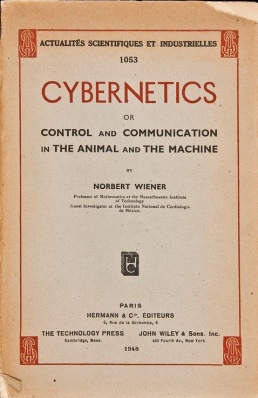 Paired with simultaneous developments in cybernetics, and despite the criticism of many, it has been subject to wide-ranging interpretations and applications outside of mathematics and engineering. This page outlines a bibliographical genealogy of information theory in the United States, France, Soviet Union, and Germany in the 1940s and 1950s, followed by a selected bibliography on its impact across the sciences. Claude E. Shannon, A Mathematical Theory of Cryptography, 1945. View online. 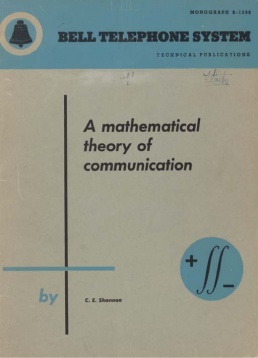 Claude E. Shannon, A Mathematical Theory of Communication, 1948. Download (monograph). 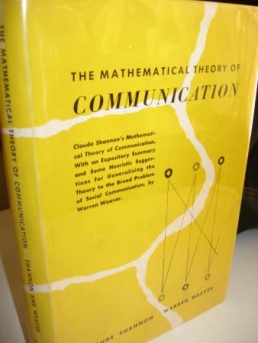 Claude E. Shannon, Warren Weaver, The Mathematical Theory of Communication, 1949. 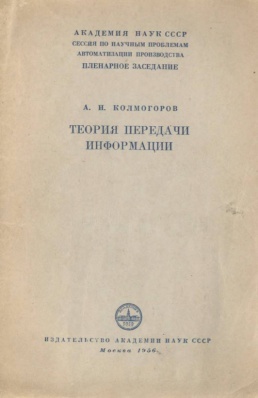 Download (1963 edition). Harry Nyquist, "Certain Factors Affecting Telegraph Speed", Journal of the AIEE 43:2 (February 1924), pp 124-130; repr. in Bell System Technical Journal, Vol. 3 (April 1924), pp 324-346. Presented at the Midwinter Convention of the AIEE, Philadelphia, February 1924. Shows that a certain bandwidth was necessary in order to send telegraph signals at a definite rate. Considers two fundamental factors for the maximum speed of transmission of 'intelligence' [not information] by telegraph: signal shaping and choice of codes. Used in Shannon 1948. Harry Nyquist, "Certain Topics in Telegraph Transmission Theory", Transactions of AIEE, Vol. 47 (April 1928), pp 617-644; repr. in Proceedings of the IEEE 90:2 (February 2002), pp 280-305. Presented at the Winter Convention of the AIEE in New York in February 1928. Argues for the steady-state system over the method of transients for determining the distortion of telegraph signals. In this and his 1924 paper, Nyquist determines that the number of independent pulses that could be put through a telegraph channel per unit time is limited to twice the bandwidth of the channel; this rule is essentially a dual of what is now known as the Nyquist–Shannon sampling theorem. Used in Shannon 1948. Ralph V.L. Hartley, "Transmission of Information", Bell System Technical Journal 7:3 (July 1928), pp 535-563. Presented at the International Congress of Telegraphy and Telephony, Lake Como, Italy, September 1927. Uses the word information as a measurable quantity, and opts for logarithmic function as its measure, when the information in a message is given by the logarithm of the number of possible messages: H = n log S, where S is the number of possible symbols, and n the number of symbols in a transmission. Used in Shannon 1948. Claude E. Shannon, "A Mathematical Theory of Communication", Bell System Technical Journal 27 (July, October 1948), pp 379-423, 623-656. Reprinted as Monograph B-1598, Bell Telephone System Technical Publications, 83 pp; repr. December 1957. 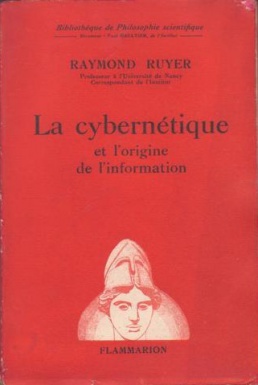 Robert M. Fano, The Transmission of Information, Technical Reports No. 65 (17 March 1949) and No. 149 (6 February 1950), Research Laboratory of Electronics, MIT. A similar coding technique like Shannon's, only deducted differently. In 1952 optimised by his student, Huffman (see below). Mathematische Grundlagen der Informationstheorie, Munich and Vienna: Oldenbourg, 1976. (German). Contents. David A. Huffman, A Method for the Construction of Minimum-Redundancy Codes", Proceedings of the I.R.E. 40 (September 1952), pp 1098–1102. Fano's student; developed an algorithm for efficient encoding of the output of a source. Later became popular in compression tools. 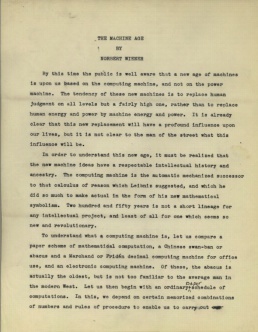 Claude E. Shannon, "Information Theory", Seminar Notes, MIT, from 1956, in Shannon, Miscellaneous Writings, eds. N.J.A. Sloane and Aaron D. Wyner, AT&T Bell Laboratories, 1993. Charles Eames, Ray Eames, A Communication Primer, 16 mm, 1953, 21 min. An educational film aimed at students, sponsored by IBM and distributed by Museum of Modern Art. Francis Bello, "The Information Theory", Fortune, Vol. 48 (December 1953), pp 136-158. The Search, 1954. Documentary film featuring Shannon, Forrester and Wiener, produced by NBC. Stanford Goldman, Information Theory, Prentice-Hall, 1953, 385 pp; New York: Dover, 1968; 2005. Léon Brillouin, Science and Information Theory, New York: Academic Press, 1956. A bestseller rewrite of physics using information theory. Information and Control journal, *1958. Founding editors: Léon Brillouin, Colin Cherry, Peter Elias. 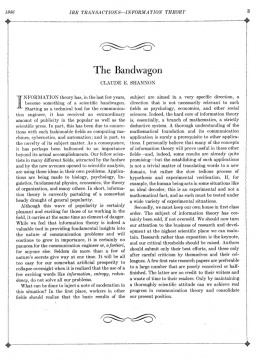 Claude E. Shannon, "The Bandwagon", 1956. Download. L.A. De Rosa, "In Which Fields Do We Graze? ", I.R.E. 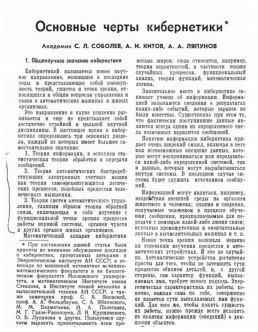 Transactions on Information Theory 1 (December 1955). Editorial by the chairman of the Professional Group on Information Theory: "The expansion of the applications of Information Theory to fields other than radio and wired communications has been so rapid that oftentimes the bounds within which the Professional Group interests lie are questioned. Should an attempt be made to extend our interests to such fields as management, biology, psychology, and linguistic theory, or should the concentration be strictly in the direction of communication by radio or wire?" Claude E. Shannon, "The Bandwagon", I.R.E. Transactions on Information Theory 2 (1956), p 3. Shannon's call for keeping the information theory "an engineering problem": "Workers in other fields should realize that the basic results of the subject are aimed in a very specific direction, a direction that is not necessarily relevant to such fields as psychology, economics, and other social sciences.. [T]he establishing of such applications is not a trivial matter of translating words to a new domain, but rather the slow tedious process of hypothesis and verification. 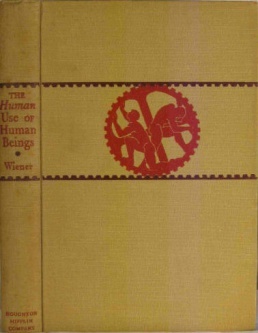 If, for example, the human being acts in some situations like an ideal decoder, this is an experimental and not a mathematical fact, and as such must be tested under a wide variety of experimental situations." Norbert Wiener, "What Is Information Theory? ", I.R.E. 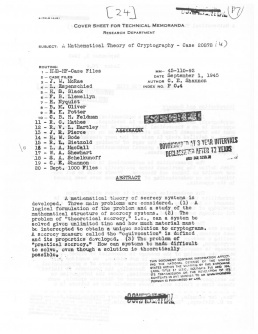 Transactions on Information Theory 3 (June 1956), p 48. A rejection of Shannon's narrowing focus and insistance that "information" remain part of a larger indissociable ensemble including all the sciences: "I am pleading in this editorial that Information Theory...return to the point of view from which it originated: that of the general statistical concept of communication.. What I am urging is a return to the concepts of this theory in its entirety rather than the exaltation of one particular concept of this group, the concept of the measure of information into the single dominant idea of all." E. Colin Cherry, "A History of the Theory of Information", Proceedings of the Institute of Electrical Engineering 98:55 (September 1951), pp 383-393. William Aspray, "Scientific Conceptualization of Information: A Survey", Annals of the History of Computing 7:2 (April 1985), pp 117-140. Karl L. Wildes, Nilo A. Lindgren, "The Research Laboratory of Electronics", in A Century of Electrical Engineering and Computer Science at MIT, 1882-1982, MIT Press, 1985, p 242-278. E.M. Rogers, T.W. Valente, "A History of Information Theory in Communication", in Between Communication and Information, Vol. 4: Information and Behavior, eds. J.R. Schement and B.D. Ruben, New Brunswick, NJ: Transaction, 1993, pp 35-56. Sergio Verdú, "Fifty Years of Shannon Theory", IEEE Transactions on Information Theory 44:6 (1998), pp 2057-2078. Ronald R. Kline, "What Is Information Theory a Theory of? Boundary Work Among Scientists in the United States and Britain During the Cold War", in The History and Heritage of Scientific and Technical Information Systems: Proceedings of the 2002 Conference, Chemical Heritage Foundation, eds. W. Boyd Rayward and Mary Ellen Bowden, Medford, NJ: Information Today, 2004, pp 15-28. Lav Varshney, "Engineering Theory and Mathematics in the Early Development of Information Theory", IEEE Conference on the History of Electronics, 2004, pp 1-6. 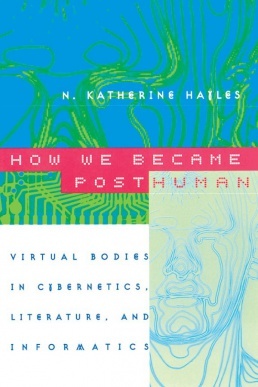 N. Katherine Hayles, How We Became Posthuman: Virtual Bodies in Cybernetics, Literature, and Informatics, 1999. Download. James Gleick, The Information: A History, A Theory, A Flood, Knopf, 2011, 496 pp. Bernard Dionysus Geoghegan, The Cybernetic Apparatus: Media, Liberalism, and the Reform of the Human Sciences, 2012, Log. Steve J. Heims, Constructing a Social Science for Postwar America: The Cybernetics Group (1946–1953), MIT Press, 1993. A survey of the Macy conferences and dissemination of information theory outside the natural sciences. Review, . 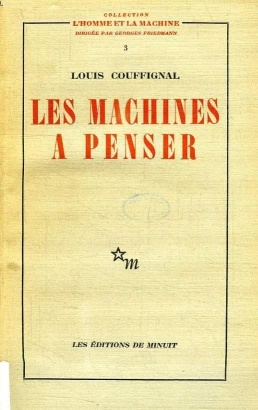 Céline Lafontaine, L’Empire cybernétique: des machines à penser à la pensée machine [The Cybernetic Empire: From Machines for Thinking to the Thinking Machine], Paris: Seuil, 2004. (French). Review. Michael Hagner, Erich Hörl (eds. ), Die Transformationen des Humanen, Suhrkamp, 2008, 450 pp. (German). Contents and Introduction, . Bruce Clarke, "Information", in Critical Terms for Media Studies, eds. W.J.T. Mitchell and Mark B.N. Hansen, Chicago: University of Chicago Press, 2010, pp 157-171. Donna Haraway, "The High Cost of Information in Post World War II Evolutionary Biology: Ergonomics, Semiotics, and the Sociobiology of Communications Systems", Philosophical Forum 13:2-3 (Winter/Spring 1981-82), pp 244-278. Philip Mirowski, "What Were von Neumann and Morgenstern Trying to Accomplish? ", in Toward a History of Game Theory, ed. E.R. Weintraub, Duke University Press, 1992, pp. 113-147. Information theory in economics. Evelyn Fox Keller, Refiguring Life: Metaphors of Twentieth-Century Biology, Columbia University Press, 1995, pp 81-118. Information theory in embryology. Philip Mirowski, "Cyborg Agonistes: Economics Meets Operations Research in Mid-Century", Social Studies of Science 29:5 (1999), pp. 685-718. Information theory in economics. Lily E. Kay, "From Logical Neurons to Poetic Embodiments of Mind: Warren S. McCulloch’s Project in Neuroscience", Science in Context 14:15 (2001), pp 591-614. Information theory in neuroscience. Jennifer S. Light, From Warfare to Welfare: Defense Intellectuals and Urban Problems in Cold War, Johns Hopkins University Press, 2003. Information theory in urban planning. This page was last modified on 7 April 2019, at 17:15. This page has been accessed 59,677 times.